Found objects (sometimes referred to by the French term for found object ‘objet trouvé’) may be put on a shelf and treated as works of art in themselves, as well as providing inspiration for the artist. The sculptor Henry Moore for example collected bones and flints which he seems to have treated as natural sculptures as well as sources for his own work. Found objects may also be modified by the artist and presented as art, either more or less intact as in the dada and surrealist artist Marcel Duchamp’s readymades, or as part of an assemblage. As so often, Picasso was an originator. From 1912 he began to incorporate newspapers and such things as matchboxes into his cubist collages, and to make his cubist constructions from various scavenged materials. Extensive use of found objects was made by dada, surrealist and pop artists, and by later artists such as Carl Andre, Tony Cragg, Bill Woodrow, Damien Hirst, Sarah Lucas and Michael Landy among many others. Henry Moore often used the natural objects he collected on his coutryside walks –stones, shells, bits of tree root – to inspire his sculptures. For Animal Head 1951 he seems to have made direct use of a found stone, using its natural form as the basis for this skull-like head. Marcel Duchamp made up the term ‘readymade’ to describe his sculptures made from manufactured objects. His infamous Fountain 1917, an upturned urinal, shocked the art world, raising questions about what art is and the role of the artist. (Find out more about Duchamp’s readymades). Surrealist artists inspired by psychologist Sigmund Freud’s writings about the unconscious and dreams, often juxtaposed unlikely combinations of found objects to create surprising and unsettling sculptures, such as Salvador Dali's Lobster Telephone 1936. (See the glossary definition for the uncanny for more about this). Minimalist artists such as Carl Andre used functional manufactured objects to create their minimal sculptures. Their aim was to get the viewer focus on the form of the sculptures rather than the artist’s skill or technique. Artists of the arte povera movement made use of a wide range of natural and everyday materials including, soil, rags and twigs. Arte povera means literally ‘poor art’ and its artists used throwaway materials in order to challenge and disrupt the values of the commercialised art world. 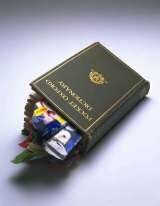 YBA artists such as Damien Hirst and Sarah Lucas make extensive use of natural and manufactured found objects in their work. Hirst uses skulls, shells, butterflies, dead animals and shells to explore themes of life and death. Collecting and categorising objects in order to understand the cultures that created them is another use of found objects often seen in the work of contemporary artists. For his artwork Tate Thames Dig, Mark Dion and a group of volunteers combed the banks of the River Thames for objects. These were then cleaned, catalogued and presented in a double sided old-fashioned cabinet. 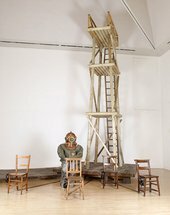 Contemporary artists such as Ian Kiaer and Cathy Wilkes juxtapose found objects to create powerful or poetic narratives which explore aspects of society or history.